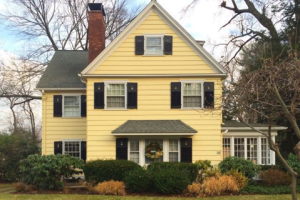 A winner of multiple Historic Preservation Awards in my hometown of West Hartford, CT, David Booth Beers is no stranger to living in an older home. He and his family live in the charming yellow 1920’s home featured above, and David has enjoyed a lengthy career of remodeling many vintage homes under his firm’s trade name Walbridge Design Build. Hailing originally from Washington, D.C., David attended Trinity College in Hartford, CT and in 1982 settled in West Hartford where he and his wife Margaret have raised their four children. As his degree in philosophy didn’t provide a ready career path, David leveraged some earlier construction experience and joined the building industry upon graduation. 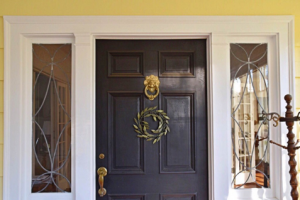 The front door of the Beers’ home with its traditional lion head door knocker. While speaking to him about his most recent Historic Preservation Award granted by the West Hartford Historic District Commission, David’s pride and passion for his work was evident. His office is full of photos and other memorabilia of the homes he has worked on over the years, both as a member of other firms and more recently as the owner of Walbridge Design Build. I had the pleasure of going on a tour with him to see many of the homes he has remodeled over the years, both inside and out, starting with the house right next door. It was so interesting to learn about his design philosophy, which centers around updating older homes for modern living while respecting the existing architecture as much as possible. 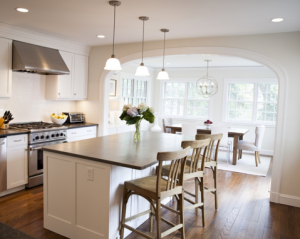 The homeowner of this 1924 Colonial Revival wanted an updated, open kitchen design that was appropriate to the home and that also integrated more easily with the outside. As you can see above, their backyard was accessible from the kitchen coming down a steep flight of steps from the back door, which would freeze over in the winter. Remodeling the kitchen required bumping out the back of the house a bit which also created a space on the lower level for a studio. It’s hard to imagine the kitchen was a cramped space and the coldest room in the house. The hardwood floors, which match the rest of the home, now have radiant heating and enough space for family and guests to gather. Instead of a narrow stairway, the kitchen door exits to an elevated patio where the family can grill and enjoy outdoor dining. The stairway was turned in the opposite direction to create a better pathway to the yard, and instead of basic pillars down below David designed stylish arched supports that blend seamlessly with the foundation of the home. 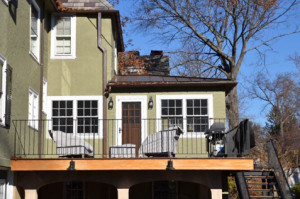 The stucco treatment of the rear addition carefully mimics the original home and has a copper roof and gutters to honor the home’s original materials as well. The final product creates a new space for easier living but looks like it has been there forever. David’s first preservation award was officially granted to the former owners of 4 Mohawk Drive, but as the project manager for the renovation he shares in the honor. 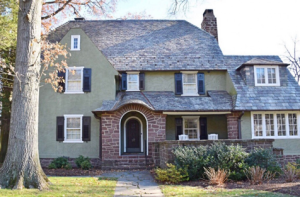 The renovation of this 1930 Lester Beach Scheide home was extensive and included a new slate roof, front entry portico, removal of inappropriate vinyl siding and recreation of the original landscape design among other changes. Extensive research was done on the home and photographic evidence was used as well to ensure that the home was truly restored to its former glory. Quality workmanship and use of the finest materials made this a shoe-in to win the awards program in 2005. David’s work on 51 Walbridge in 2006 garnered another award. The 1923 home by Russell Baker was showing its age in failed roofs, stucco and exterior painted surfaces. The slate roof was beyond repair and the home had ice and water damage due to issues with the gutters. The homeowners decided to restore while also making some improvements. The preservation award specifically noted the preservation of the stucco, lighting, copper flashing and gutters on the home. Although the roof turned out beautifully, it was not considered to be part of the award since the new roofing material was not slate but a quality product designed to look like slate. 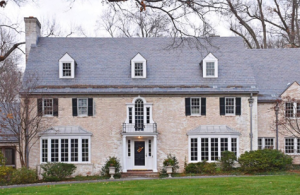 With the cost of a slate roof being at least twice the cost of the man-made roofing used, it’s not hard to understand why the homeowners went with a different material. 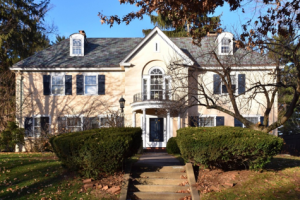 Unfortunately a fully accurate restoration is cost prohibitive at times, but it seems to me that the look and feel of the new roof certainly honors the past and was a much better choice than typical asphalt shingles. 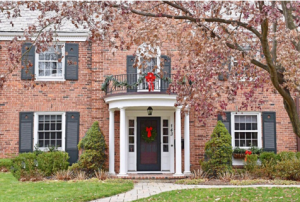 The above home is an example of a remodel that wasn’t a restoration of the original but an intentional design change to improve the form and function of the portico. As you can see, the original portico was very shallow and didn’t provide any real protection against rain and snow to visitors. David was tasked to fix that for the homeowners and his new design below, while not a recreation of the original, is in keeping with the original home. Of particular note is the iron rail detail above the door. It’s hard to see due to the Christmas decorations, but the design of the railing is in the exact style of the original. Well done! 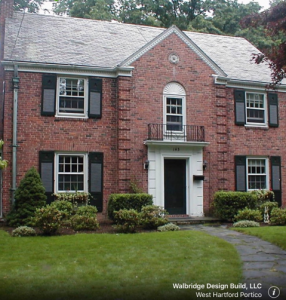 The town of West Hartford has a huge inventory of homes build in the 20’s, 30’s and 40’s. 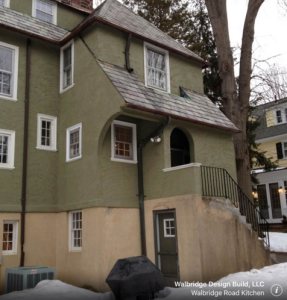 The majority of them are not protected by any sort of preservation ordinance, so it’s encouraging to see homeowners and remodeling firms such as Walbridge Design Build working together to repair, restore and rejuvenate their older homes for modern living. Read this story as well as other stories featuring greater West Hartford buildings at: The Front Door Project.